LONG BEACH — Singlehanded sailors Charlie Buckingham in Laser Full Rig and Matt Struble in A Class catamarans each won all seven of their races in Alamitos Bay Yacht Club’s annual Memorial Day Regatta May 25-26, but they missed the glory afterward. No problem. At awards time, Buckingham, America’s leading Laser sailor, and Struble were already headed home for nearby Newport Beach and San Diego, respectively, but Buckingham had a notable stand-in. 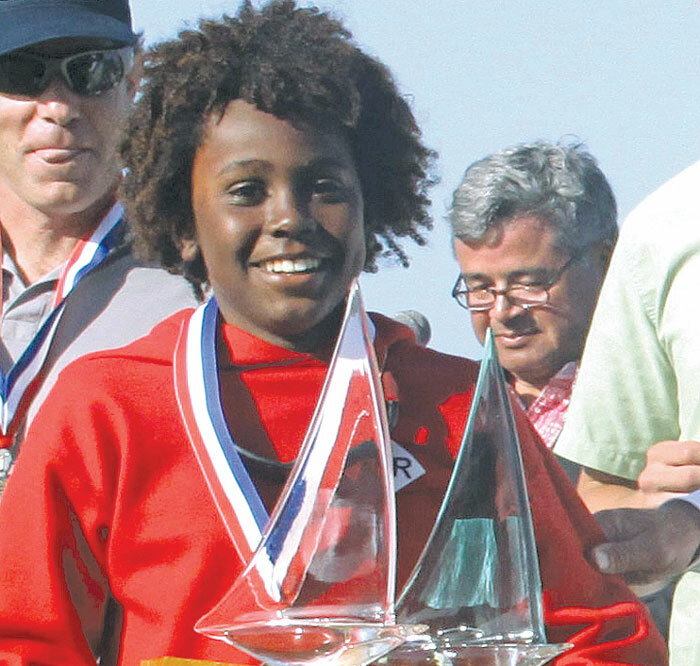 In his absence, William Sutton IV, age 12, from Richmond Yacht Club in Northern California, was asked to receive the US Sailing Area J Zucker Perpetual Trophy for first place in the Area J semifinals — although Buckingham, 25, will be the one advancing to the national championships. Sutton, nicknamed “Berky” for his home in Berkeley, won’t be eligible for that event for another five years, and he didn’t exactly finish second here. In fact, choosing to sail a less-demanding Laser Radial in the ocean fleet against stronger competition rather than inside the protected bay, he finished last in every race — but he finished every race, although missing the time limit in one. And he’s learning from conditions such as those on Sunday, when his 92 pounds were tested by choppy water and a steady breeze building to 12 knots. He also has goals beyond sailing. While he already plays the violin and speaks Mandarin, he also wants to be an orthopedic surgeon. His was at the helm of one of the 135 boats in 16 classes that participated in this year’s event. Other impressive performances in winning six of seven races were logged by Mission Bay Yacht Club’s Scott Miller and his Alamitos Bay YC crew, John Williams, in Formula 18 catamarans; Randy and Kathryn Smith of San Francisco Yacht Club in the Mercury class; Alamitos Bay YC’s Robert Rice and Matt McDermaid in the Portsmouth mixed class; and Bruce Fleming of Hawaii’s Kaneohe Yacht Club in singlehanded Weta trimarans. A CLASS CATAMARAN (8 boats): Matt Struble, USACA, (1)-1-1-1-1-1-1, 6 points. FORMULA 18 (5): Scott Miller/John Williams, Mission Bay YC, 1-1-1-(5)-1-1-1, 6. KITEBOARD (12): Brian Kender, (2)-1-1-1-1, 4. VIPER 640 (8): Ed Feo/Chris Deneen, Alamitos Bay YC, 1-1-1-2-2-2-(3), 9. WETA TRIMARAN (7): Bruce Fleming, Kaneohe YC, (8)-2-1-1-1-1-1, 7. LASER FULL (Ocean, 23): Charlie Buckingham, Newport Harbor YC, (1)-1-1-1-1-1-1, 6. LASER FULL AREA J SEMIFINAL (16; no discard): Buckingham, 1-1-1-1-1-1-1, 7. LASER RADIAL (Ocean, 16): Lawson Willard, St. Francis YC/San Francisco YC, (5)-1-1-2-2-5-1, 12. LASER RADIAL AREA J (4): Lindsey Baab, St. Francis YC/San Francisco YC, 2-1-1-1, 5. MERCURY (6): Randy Smith/Kathryn Smith, San Francisco YC, 1-1-1-1-1-1-(2), 6. PORTSMOUTH (6): Robert Rice/Matt McDermaid, ABYC, (2)-1-1-1-1-1-1, 6. LIDO 14 A (8): Stu Robertson/Sammy Elsharhawy, Alamitos Bay YC, 1-1-1-(3)-1-2-2-1-1, 10. LIDO 14 B (4): Michael Eisenberg/Julia Rychick, Del Rey YC, 2-(3)-1-2-1-2-2-2-1, 13. SABOT SENIOR (9): Freddie Stevens, Alamitos Bay YC, 4-3-1-2-1-3-1-1-(10), 16. SABOT C2 (3): Kai Lee Malm, Newport Harbor YC, 1-2-1-3-1-1-4-1-(8), 14. SABOT C3 (2): Noah Greenberg, Alamitos Bay YC, 1-1-1-1-1-2-1-2-(3), 10.